October Brings Ghosts and a Near Death Escape! Located amid the hills ‘n’ hollers of the Arkansas Ozarks sits a 126-year-old Historic Hotel of America that has been dubbed “America’s Most Haunted Hotel”. And it was not a “self- dubbing”. Just last year the 1886 Crescent Hotel & Spa, located here high above a community that is -in its entirety- on the National Register of Historic Places, was so recognized by TripAdvisor®and Yahoo! Travel. It is only in recent years that the hotel’s “guests who check out but never leave” have become legendary. “There have been tales of paranormal experiences in this building for as long as anyone can remember but thanks to worldwide exposure over the past few years on such television programs as NBC’s ‘Today Show’, Syfy’s ‘Ghost Hunters’ and A&E Biography’s ‘My Ghost Story’ , as well as a Money section’s front-page article in USA Today our unexplainable activities and encounters have been given both credibility and notoriety,” said Bill Ott, hotel director of marketing and communications. The spooky sojourn about which Ott is referring is the midnight séance in the hotel’s Crystal Ballroom where illusionist and medium Sean-Paul of Eureka Springs’ Intrigue Theater will make an effort to contact long-departed grand illusionist, world-famous escape artist and legendary magician Harry Houdini. Purchase tickets for the Halloween Houdini Seance-10pm. See this first time escape done at the Crescent Hotel on Thursday, October 4th at Noon on the East Lawn. FREE to the public. For more information, one may go to americasmosthauntedhotel.com or contact the hotel at 479-253-9766. EUREKA SPRINGS, ARKANSAS — San Francisco (CA) may have Lombard Street but it has been said by visitors who travel to Eureka Springs (AR) on motorcycles that the streets here are “Lombard Street” street after street after street. These curvy streets inside this Arkansas village of 2,000 and the winding Ozark highways that lead into this community offer the appeal that make motorcyclists want to literally “lean into” Eureka Springs. Motorcyclists, whether they are on two wheels or three, will use this Swiss-like village as their hub for discovering and riding such provocatively named routes as The Pig Trail, Ozark Highlands and the equally as challenging connecting routes to stretches of roads as Arkansas Scenic 7 Byway with its awesome panoramas. Along these routes are such notable mini-destinations as Buffalo River National Park, Branson (MO) and Bentonville (AR) with its newly opened, world-renowned Crystal Bridges Museum of American Art. All are within a day’s round-trip ride from Eureka Springs. “And those curves I mentioned are best described in that same recent Motorcycle Mojo article, ‘With more corners, closer together, than anywhere I’ve been, these are some of the greatest motorcycling roads on the continent.’ This is a pretty good endorsement and invitation to motorcycle enthusiasts to come and ‘lean into’ the extraordinary destination known as Eureka Springs, Arkansas,” added Moyer. Eureka Springs has grown to embrace motorcycling visitors. Restaurants themed for “bikers”, retail shops carrying a full line of motorcycling accoutrements, hotels and motels with special features just for motorcyclists, and so on are now common place. 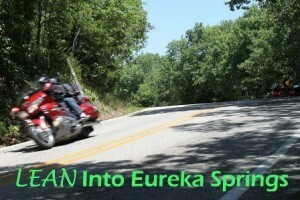 For more information on what Eureka Springs has to offer motorcyclists, one should go to eurekaspringsmotorcycleroutes.com. Lodging information and special motorcycle packages can be found at eurekaspringsonline.com . Keith Scales, organizer for the upcoming Parallel Universes Weekend in Eureka Springs (AR) has updated the list of speakers for this popular event being held at the 1886 Crescent Hotel and Spa, August 24-26. The weekend is being billed as “… where science and the supernatural meet. Speakers (and their topics) for this special three-day weekend are Maja Vajra, Founder of the Quantum Buddhist Association (The Development of Mind Substance from the Raw Material of Personal Experience); Larry Flaxman, author/screenwriter/Founder of ARPAST-Arkansas Paranormal & Anomalous Studies Team (The Grid: A New Theory on Everything); Dr. Jim Walden, intuitive wellness and well-being coach/holistic healing educator (Holistic Healing Through Quantum Interconnectedness); DR L. JOHN GREENFIELD, Chair, Department of Neurosciences, U.of A for Medical Sciences (Brain, mind and the Paranormal); Dr. Sarkis Nazarian, neuro-opthalmologist (Vision and the Brain; auras, hallucinations, deja-vu, agnosia, paredolia and other bizarre activities); and Dr. Leslie D. Hannah, Director of Cherokee Programs at Northeastern State University (Pirsig’s Paradox and the Reality of Ghosts). “All speakers will participate in a panel discussion on Saturday evening, which promises to be lively!” said Scales. Sessions include “The Seen and The Unseen”, “The View From Beyond: Evidence of the Irrational”, The Scientific Viewpoint”, and “In Search of Answers”. “This conference is for those interested in exploring the territory between the known and the unknown,” concluded Scales. He may be contacted via email at kscales@ix.netcom.com. Science and the paranormal meet here the weekend of August 24-26 at one of America’s premiere paranormal Meccas, the 1886 Crescent Hotel and Spa. The three-day event, entitled “Parallel Universes: where science and the supernatural meet”, will offer fans of both ends of this spectrum a full weekend of seminars, investigations and experimentation. The question that will be a continuing theme throughout the weekend will be “Could paranormal investigators, particles physicists and neuroscientists be on the same track?” The assembled experts and those interested citizens in attendance will conduct question-answering experiments. Those experts attending include Larry Flaxman, founder and president of ARPAST and co-founder of Para Explorers; Dr. L. John Greenfield, chair of the Neuroscience Department of the University of Arkansas for Medical Sciences (UAMS); Dr. Sarkis Nazarian,UAMS neuro-opthamologist, and Maha Vijra, founder of the Quantum Buddhist Association. “Joining these and other experts participating in this Parallel Universes weekend will be plain, everyday folks who either have had an experience and want to share or those men and ladies who have a desire to learn more of ‘what’s out there and why’,” concluded Scales. Scientific investigation depends on proof-reliable data, repeatable experiments, accurate interpretation of results-in order to better understand the universe. Paranormal experience is not about investigation-usually supernatural phenomena erupt into everyday life when least expected. Today, paranormal investigators are employing the tools of science and the latest technological innovations to record experiences that science has traditionally regarded as unverifiable. At the same time, science is developing new models of reality-multiple universes, entangled particles-that may one day explain the currently inexplicable. Are paranormal investigators and particles physicists on the same track? Larry Flaxman, a best selling author and paranormal researcher, will be the key note speaker in this 3 day conference. Learn more about Larry Flaxman! A one-hour, jam-packed, keep-‘em-guessing supernatural comedy-murder-mystery thriller. Finger food and opinion exchange. Testimonials reporting near-death and out-of-body experiences, other inexplicable phenomena. wellness and well-being coach, holistic healing educator. A WORLD IN A GRAIN OF SAND; the imagination dimension. 12.30 – 3.45pm Lunch on own. Options: full service in Crystal Dining Room or lunch buffet in Baker’s Bistro? Explore Eureka with van tours or walking guide. Saturday morning, and how organized and prepared everyone was for the event. class service, consistantly and repeatedly. Please thank all of them for me. Conservatory sometime in the not to distant future. chairs and lights off the Boardwalk railing! What is it like to stay at the Crescent Hotel? Reserve a room on either Sunday or Monday and receive 20% OFF Primary Spa Services at the New MOON Spa and 2 for 1 Mastermind Theater tickets! Where science and the supernatural meet. An investigation at the Crescent Hotel. 5 Attractions You Don’t Want to Miss! from the guests point of view! Have you seen a ghost? Explore the ghosts of the Crescent nightly on our Ghost Tours. Spa Time with the Girls! Now its Your Turn to EXPLORE the Crescent Hotel! July Hot Deals will help you SAVE! 2 Live Ghost Theatre Productions! New Ghost Theatre Productions at the Crescent Hotel-You Don’t Want to Miss!